What is a Corporate Messaging Strategy? What does your corporate messaging strategy communicate to your consumers? What about to your employees, vendors, and potential customers? Where do you even begin when trying to create an effective messaging strategy? 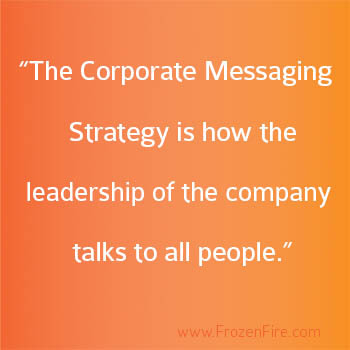 The corporate messaging strategy is how the leadership of the company talks to all people. The message itself should be consistent and transparent and should be a tool that is used to build trust and develop relationships with customers, clients, employees, etc. Creating a corporate messaging strategy that will be effective in building these relationships can be accomplished via market research. Before beginning your research, it is important to ask the question, “What motivates or triggers our consumers to make certain decisions?” Market research is the process by which we answer that question, and once those triggers are determined, every marketing message should revolve around them. The message created around these triggers must be consistent throughout the organization, including how employees communicate to existing and prospective customers. There are several analytical components to consider when conducting market research in order to effectively identify consumer behaviors and create a messaging strategy. One of these components is competitive analysis. When getting to know your competitors, it’s important to look at the ways that they are attracting customers. Analyze how they are driving traffic to their online platforms, including websites and social media, by learning what keywords they use, what kind of information they supply online, benefits they offer their audience, and how they attempt to further engage the current or potential customer. Understanding the environment that you are competing in is essential to creating a successful messaging plan that will allow you to stay ahead of the competition and in the mind of the consumer. As mentioned before, it is important to get to know your target market to identify their decision-making triggers. There are various ways to do this including conducting focus group research. This form of market research is expensive and takes a great deal of time and coordination. It can also take months to get the results you’re looking for. Face-to-face or “street interviews” and web surveys are other forms of market research that are simple ways to get information from a target audience. The quickest and most effective form of market research however, is highly targeted, phone-based research. This form uses neuromarketing techniques to trigger the participants’ brain in order to influence their engagement with you, establish trust, and influence them to move towards a next step. Once you understand the environment that you are competing in, have recognized what is and isn’t working for competitors, and have determined what triggers your consumers to make decisions, you can create a corporate message and develop a plan for getting your message out to your employees, customers, and more. Your message should communicate who you are, what you do, why you do it, and why your current and potential customers should care. You must be able to convey relevant, educational, and timely information that benefits all stakeholders. It is crucial to communicate the corporate message with everyone in the corporation as to not jeopardize the strength of the message. Once everyone in the corporation understands what they should be communicating to clients, customers, and anyone else the company wishes to influence, it’s time to distribute and share your message. This is where the strategy comes in. You must decide which channels will be most effective in getting your message in front of the right people. Determine when and where certain audiences like to receive information. Once a company is effectively connecting with customers and all messaging vehicles are in place, the next step is to optimize communications efforts. Do you need help identifying your customers’ behaviors and triggers? Do you know how your competitors are driving website traffic and sales or where to even begin your research? At Frozen Fire, we are market research experts that can help you identify these things and create a messaging strategy that will effectively connect you to consumers and optimize your communications efforts.